Hey there, Ready Nutrition Readers, did you get a good night’s rest? Artistic license or stylistic endeavor aside, this author is firmly convinced that Poe was nuts. Although such an assertion is probably true, he never really clarified the aforementioned quote; therefore, it is an utterance. He probably meant that his visions (so aptly transcribed into tales, aided with opiates) were in his sleep, tormenting him. Yes, he was nuts. Sleep is ordinarily a very pleasant and useful function in our life cycle. The information in this article is meant to serve as an introduction to sleep disorders; this article’s purpose is to prepare the reader with useful background and basic information that may help. The information presented herein is strictly for informational purposes only and is not meant to diagnose, treat, or prescribe any condition or action for anyone. Only a qualified, licensed, certified, approved physician can do such. Prior to taking any actions or utilizing any information set down in this article, please discuss it with your family doctor. The reason these herbal aids are given here is that during times of emergency and disaster, people need the proper amount of rest and oftentimes they cannot obtain it. The stressful situations combine to produce restlessness and insomnia and can create long-term sleep issues, as a result. 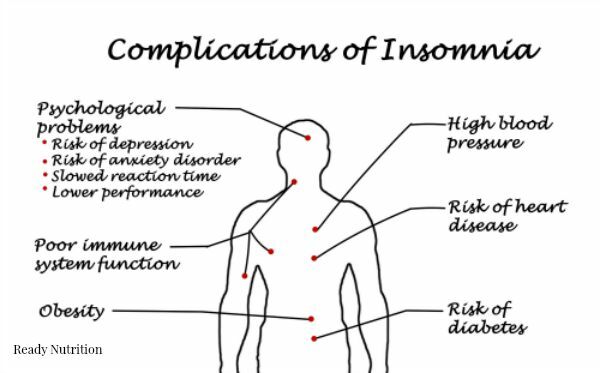 In fact, there are many health-related complications that can arise if insomnia is not treated. 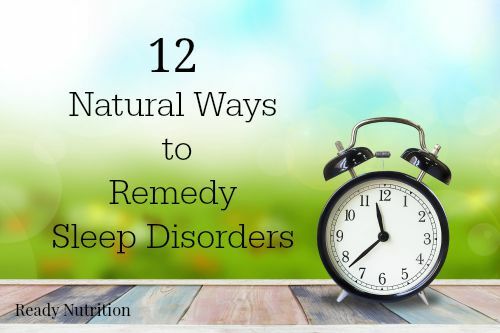 Many have turned to herbal remedies to naturally treat insomnia and other sleep disorders because they do not have long-lasting side effects or damage on your metabolism. They are readily obtained and inexpensive, as well as being effective without complications. Sleep disorders are defined as any condition that interferes with sleep. These factors can be environmental (such as noise, extremes or changes in temperature, movement, or pattern disturbances due to travel) in nature. Dyssomnias (difficulties in sleeping) are further broken into insomnia, sleep apnea, and restless legs syndrome. Insomnia is an inability to fall asleep when sleep would occur naturally. Insomnia’s forms are when a person is unable to fall asleep, remain asleep, or a combination of both. Many extrinsic factors can cause insomnia, the most common sleep disorder. Illness or physical injury, coupled with physical pain may also be factors. Psychological factors of stress or anxiety also detract from sleep. Medications (prescription or over-the-counter) can also play a role. The usage of controlled substances and/or alcohol affects one’s sleep cycle. Finally, dietary changes can also cause serious problems with sleep. Sleep is a periodic rest-state that holds differing levels of unconsciousness and lowered/abated levels of inactivity. More than ½ of the world utilizes a nap in the afternoon, making it a regular part of their sleep routine. Generally, newborns require up to 20 hours per day. Children need between 8-14 hours a day, and adults need anywhere from 3-12 hours with 7-8 hours being the normative average. The elderly decrease to approximately 6 hours per night, and women over the age of 35 tend to need more sleep than men. Do not look at your cell phone while laying in bed. This will only wake you up and cause you stay up for longer. Many of you may have tried these things before, to no avail. Give it another try. You also have some herbal/naturopathic options at your disposal. The following herbs are wonderful at assisting your body in calming itself to promote sleep. 1. Valerian (Valeriana officinalis) is an extremely effective natural sleep aid. The herb is a centrally depressive mild sedative that also has muscle-relaxing qualities. Valerian reduces the sleep induction time. A study with 121 patients was administered 600 mg per patient with tinctures of 70% ethanol extracts of the root for 28 days. At the end, 66% reported good or very good ratings of the results. Valerian is contraindicated in those with liver problems due to potential hepatotoxic reactions. Cautions include those on regimens of anticoagulants and curcumin, those using barbiturates, benzodiazepenes, ethanol, or those on an Iron regimen (the tannin effects in Valerian are increased), and with Loperamide. Those suffering restlessness can use 220 mg extract three times per day. For sleep, use 400-900 mg, approximately 30 minutes before bedtime. 2. German Chamomile (Matricaria recutita) has both sedative and anticonvulsive effects on the central nervous system. The use is contraindicated for pregnant women. The herb comes in capsule, liquid, oil, or tea form. Take it as an infusion: 3 grams with 1 cup of water, and cover. Allow it to steep 5-10 minutes. 1 tsp herb = 1 gram. German Chamomile is relatively easy to cultivate and is extremely safe. 3. Lemon Balm (Melissa officinalis), and the medicinal parts are the dried leaves, fresh leaves, and the whole plant is also a wonderful herb to promote sleep. The herb is used for nervous agitation and sleep problems. Prepare a tea by pouring 1 cup of hot water over 1.5-4.5 g of Lemon Balm; strain after 10 minutes. You can take several cups (2-3) during the course of a day. 4. Finally, essential oils are used in aromatherapy to help relax the body. In fact, there are many oil blends to are very effective in relaxing the body to promote sleep, such as this Goodnight Blend from Eden’s Garden  or this Stress Blend . Both will help to relax and transition the body into sleeping. With all of these herbs, keep in mind that they can be potentiated by other substances, meaning if you take them in conjunction with other CNS depressants or sleep aids, they may add to the stultifying/soporific effects, and not necessarily in a positive manner. Once again (Ad infinitum), please obtain your doctor’s permission before using any of these foods and/or taking any actions outlined herein. In this manner you can safely proceed after the physician has cleared all of the variables and any potential drug interactions or possible complications. Have a good day, and yes, sweet dreams!